First, thank you so much for this web page. It is such a good tool & I was so happy when I found it! I do have one suggestion- Would it be possible for you to make a “Best of Vegan Options” section? I greatly appreciate the entire list, but sometimes the really good items (like Whispering Canyon Cafe’s skillet meal with vegan meats) gets lost in the much longer lists of places that offer things like coffee with soy milk, fruit cups, and hummus. I think every bit of highlighting & promotion will help Disney understand how much the public really wants these options. And making a more prominent page/place for these special dishes may also be helpful in attracting more folks that are “vegan curious”, getting them to branch out & try something new. All Star Movies can also do a pasta with marinara sauce, pizza with the daiya vegan cheese upon request, and vegan ice cream! The ice cream can be made into sundaes and vegan milkshakes. The chefs there are super accommodating! Ale and Compass will do a veganized version of their vegetable flat bread with Daiya. Just had it last night. Hot off the press! We are great followers of your website when we visit DW from the UK. We are currently staying at the Polynesian and have previously eaten in the Kona Cafe and Breakfasted with Lilo and Stitch. As the day was warmer today we decided to spend some time at the pool and around lunchtime I visited Captain Cooks. On the off chance they had something extra vegan lurking behind the scenes I asked the lady at the till. She then proceeded to call another member of Staff who came to see me and advised me they had some vegan burgers they could do for us 😮 Apparently I was the first to ask since they had them in stock and they then told me that they would be on the new menu out tomorrow!!!! 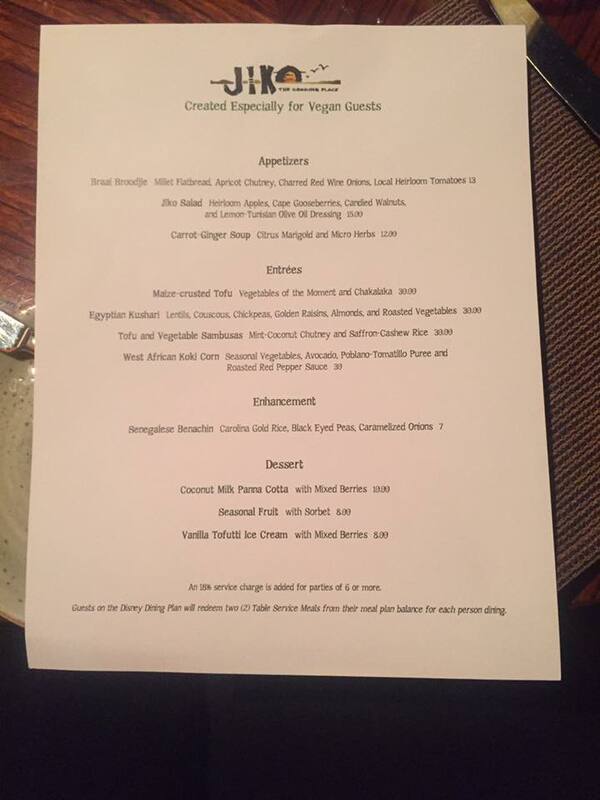 Along with some other vegan friendly options!!! Needless to say….. I was overjoyed as we have been hunting out all the vegan burgers here at Disney World! I then proceeded with my treasures back to the pool with a happy grin on my face to share my news with my husband and daughter who had only asked for fries! I don’t think the bun is vegan so we had lettuce buns but the burger had tomato’s and large pickles on so it was still lush 😀 and they cooked the fires separately too! The Boardwalk Bakery no longer carries vegan cupcakes. They have switched to BabyCakes packs of GF that contains eggs and dairy. Stayed at Pop in September 2018. They have tofutti ice cream avaiable as well as pineapple dole whip. I got a huge bowl of each for two snack credits. I can’t believe I didn’t know this before, but at All Star Music (and presumably the other two All Stars) you can by a coffee cup from the cashier in the food court, then after you fill it with coffee at the beverage stand, you can ask someone for soy milk. They’ll go get a little container of Silk and pour it in your coffee. I was a cast member at All Star Movies recently, so can confirm that they do this at the other All Stars as well! We are at All Star Music at the moment. They are still doing the Beyond Burger and also have a vegan ratatouille with polenta on the menu which was nice. What is the red text on some of these?? Is it unconfirmed choices, or new things added?? Just want to let you know I ate at Olivia’s last night and chef joe made me an off menu tofu dish! It was pesto tofu over a big plate of veggies with a carrot sauce. SO good. Hello. Thanks for all the work you do with this. It’s super helpful. Is Chef TJ back to Monday-Fridays now? I’m booking a dinner in August, looking at a Friday night, and want to do what I can to make sure I don’t miss him. Thanks! Hi there, we are unsure if he has switched back yet. It seems like he is still currently Sunday-Thursday. hi! He is out until mid April due to a surgery he is recovering from. They do still do a small version of his feast, but it is not as extravagant. I will say we really loved our breakfast we had there, we have a review of it on our page too. Spyglass Grill at the Caribbean Beach resort has vegan black bean tacos with plantain chips (literally called “vegan black bean tacos”)! OMG!!! I made a booking at the Trail’s End for myself and my Omni cousin. Chef TJ wasn’t in (even though it was Monday), but Chef Steven did a wonderful job and even called my bluff when i said there’s always room for dessert … i’ve never said no to dessert and i had to quit after a few bites as I was so full. He showed me which salads I could have from the bar, and then proceeded to bring out Samosas, Nachos, Soup, Grilled Veggies/Tofu and Fried Rice and then a Toffuti Ice Cream Sundae with Bananas, Enjoy Life Cookies, Strawberry Sauce and Hershey’s Syrup (i swear it was almost an entire tub of tofutti ice cream in my 1 serving). We stayed at All Star Sports last week and the veggie burger there is not the Beyond Meat burger. We walked over to All Star Music and not only did they have the Beyond burger, they also had a plant-based bowl with chickpeas, red onion, beets, cucumbers, pumpkin seeds, grains, and Beyond Meat chickn strips that was really good. Thank you for that update! Well changed that. Can you definitely get Tonga Toast that is vegan at Captain Cook’s? Did you ask to speak to a chef or just order it at the kiosk? I don’t remember seeing it on the menu last year. Also I should add from my experience at The Wave last night that after I told the waitress I was vegan she added glazed tofu on my udon bowl and it was amazing. For dessert, the Trio is Sorbet is vegan and very good, and she mentioned they also have Tofutti and Rice Dream Ice cream but the sorbet sounded better to me. The Wave at the Contemporary has a vegan Udon Bowl on the menu and the waitress offered me Earth Balance butter for the already-vegan bread! Yum!! Love finding vegan butter. I had the udon bowl last night & it was delicious! We’ll be sure to link to your post when it’s up for this. Thanks penny! the family and I are staying at the Dolphin and the seafood style restaurant “Bluzoo” was a must for my fish eating wife and kids. I was pretty pissed because, looking at their menu, I thought I would be paying 30 bucks for a salad. when we finally got seated and talked to the waitress she suggested their lobster dish with tofu instead of lobster. the tofu was excellent. Nice crispy exterior with a soft center. the dish came with a julienned salad and what looked like steamed bok choy and was then coated in what I think was a teriyaki sauce. the meal was delicious but I would suggest asking for them to go easy on the sauce as it can be pretty overpowering once you get over how accomadating the dish was. This is great to know! Well add that to it the list.